After Liverpool’s commanding performance in the Champions League, the Dutch defender has called for caution. VIRGIL VAN DIJK says he struggled to sleep after Liverpool’s “total performance” against Manchester City in the Champions League. Jurgen Klopp’s men upset the Premier League leaders with a rampant 3-0 victory at Anfield in the first leg of the all-English quarter-final. In-form forward Mohamed Salah was among the goalscorers in a complete display from Liverpool, who beat City for the second time at home this season after a previous league win. And Van Dijk said the way Liverpool played against Pep Guardiola’s side showed how dangerous they can be when they perform to the top of their game. “It was difficult to fall asleep [after the game],” Van Dijk said to Liverpool’s website. “I knew before I joined, and know now, how much quality this squad has and how good we can be if everyone is at 100 per cent. “The game at home was an amazing example – everyone was 100 per cent focused and at it. Everyone showed their quality. And you see what can happen. A commanding first-leg display has put Liverpool in a dominant position ahead of the return match at City’s Etihad Stadium home on Tuesday. 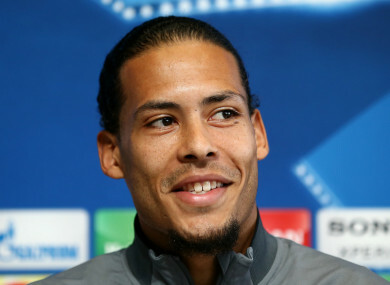 But Netherlands captain Van Dijk says Liverpool will be taking nothing for granted, even though scoring once will mean City have to hit five – as they did in September’s 5-0 demolition following Sadio Mane’s early red card for a high foul on goalkeeper Ederson. “You can’t deny that being 3-0 up is going to be a little bit in your mind,” Van Dijk added. “But we need to go into the game with the mindset that it’s still 0-0. We want to win the game and we want to play well. Email “Van Dijk couldn't sleep after 'total performance' against Man City”. Feedback on “Van Dijk couldn't sleep after 'total performance' against Man City”.